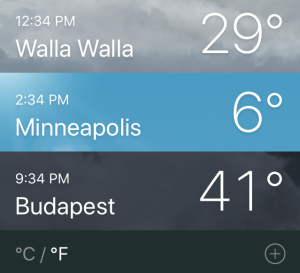 Well, it’s not exactly warm in Budapest, but better! Almost everything is in place! As of this post, I have just under a week left in Minnesota. 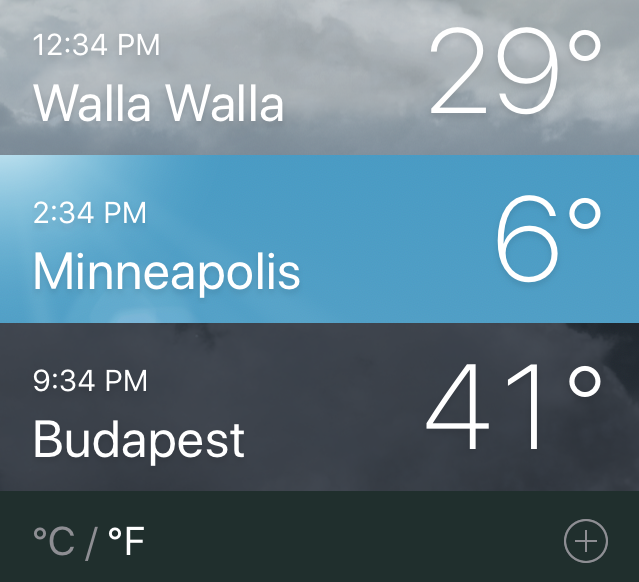 Packing is underway, I have begun preparing for my intensive Hungarian language course, and every time I check, the temperature in Budapest is over thirty degrees warmer than in Minneapolis. I think that I’m ready. 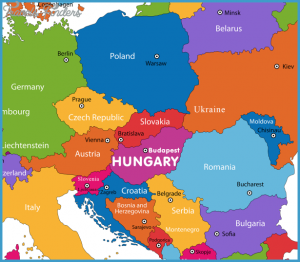 Guess where Hungary is–and don’t scroll down! If you did, congratulations! That’s uncommon knowledge. If not, it’s certainly not your fault. It’s just another small, gall bladder-shaped, central European country. If you want to remember it, here’s my mnemonic device. I usually find Germany, and then to the east I find Czecho…slovakia (now, Czech Republic and Slovakia) and immediately below, Austria-…Hungary (now, Austria and Hungary). Both were once unified countries, but split for various political reasons. Hungary is a country of about 10 million people. The official language is Hungarian, and has a majority ethnic Hungarian population. 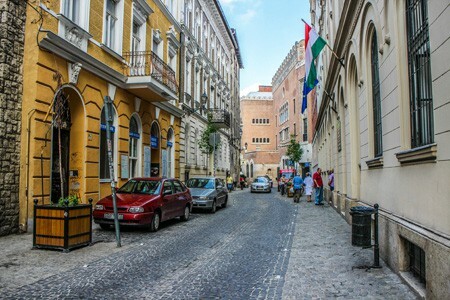 Located on the river Danube is the capital of Budapest, a major European city that, despite the fact that it contains only a fifth of Hungary’s people, accounts for about half of its economic output. 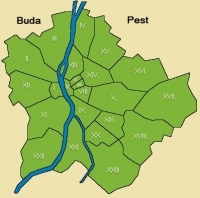 The city was unified in 1873 from two cities on either side of the river: to the west is Buda and to the east is Pest. One of the most interesting questions that I’ve encountered in my research of Hungary is: who are the Hungarians? 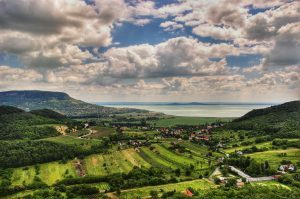 Unlike nearly all their neighbors in central Europe, the Hungarians are not Slavic. The Hungarian people, also known as the Magyars, are descended from nomadic tribes that invaded and settled in the Carpathian Basin around the year 900. While there is significant recorded history of the raids and battles they had in Europe, there is uncertainty as to their original homeland. 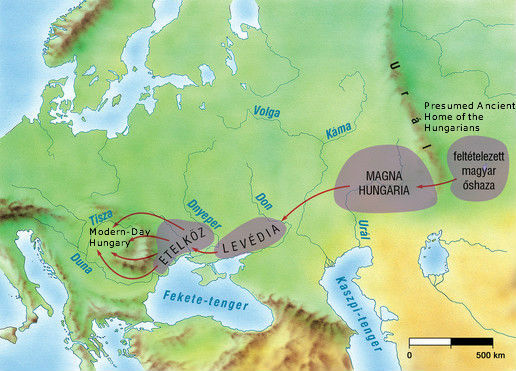 Most scholars believe that they came from between the Volga River and the Ural mountains (as depicted in the map below), but others speculate that they may actually have Iranian origins, or were once related to the Huns of Western Asia. Next week, when I arrive in Budapest, I will begin my classes in Hungarian, a fascinating language. It has the distinction of being the most common Uralic (derived from the Ural mountains) language in the world, for the simple reason that there are very few languages in this family. Hungarian’s most widely spoken relatives are Finnish and Estonian, and these are not even very similar. I’m sure that I will write more on the Hungarian language in the near future, but suffice it to say that I am in for a linguistic treat! Next time I write, I will probably be leaving—so, köszönöm és viszlát! This entry was posted in Uncategorized on January 3, 2018 by nathaniellarson.